The whole characters looking dark issue was another thing, as in order to adjust the lighting and mood, I have it set to change the colour settings of an actor upon creation. Hey filler, did you ever get my PM? Yes I did, I forgot about the project, actually. Been working on a map, too. 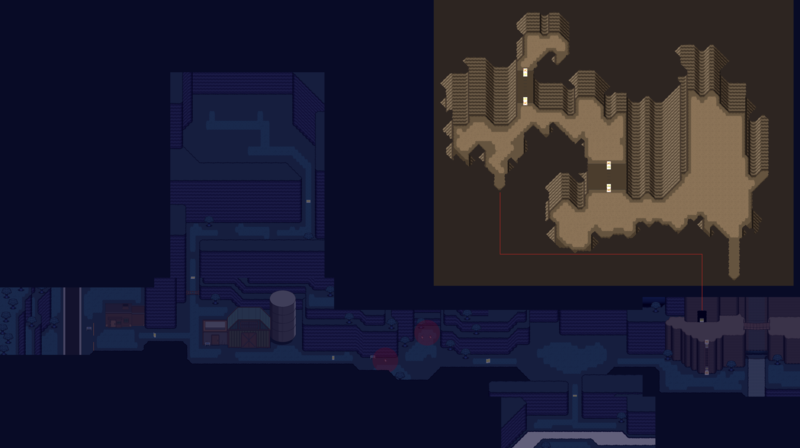 More map progress, some of them have been redone a bit. The details are slowly clicking into place. 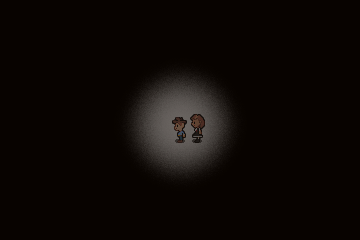 Cutscene stuff is getting worked on, now. So, the game's development has been semi-restarted. This is due to the fact there was many issues with the fact I wasn't researched upon proper game development, and I did everything by what I felt fit the original development of the game. Ranging from lack of ideas, to even not even having a game design document (ouch). The artstyle will actually be updated a bit. Sprites will be larger, and less deformed in order to support better animation quality overall. Though, they use the same design styles overall. Some of the areas will be intact, the major differences will be that generally, everything will be designed to fit together first, than just clobbering what works. 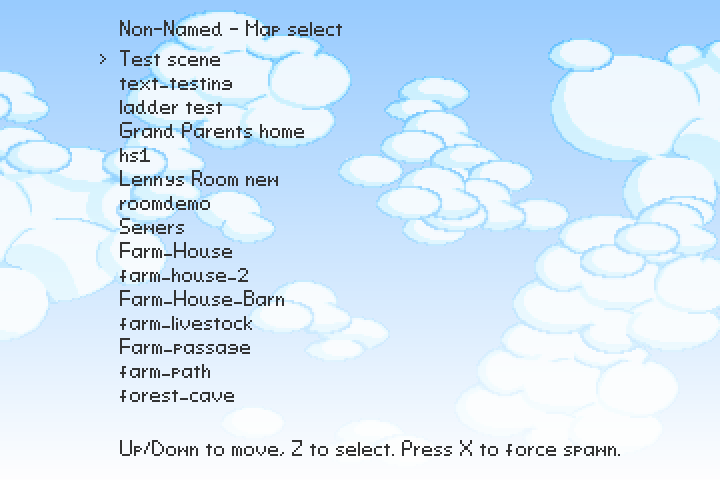 As a sense of cohesive flow is required for such a large-scale game. Due to this, updates are going to become very slow. As I want to plan everything out before working on real meat of the game. 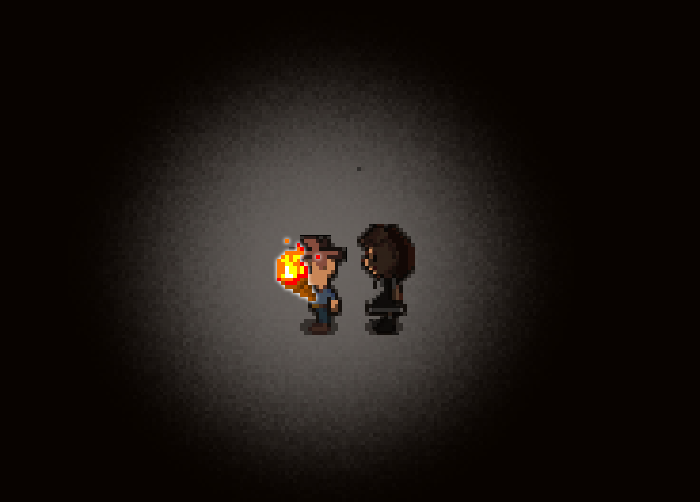 Example of the newer Sprite design, they're taller, and more resemble people than before. to even not even having a game design document (ouch). Well, you don’t really need to have a game design document; none of my games have had one. Same here. Never had one. Do map out the content and effort though. I always use changelogs. The Game Design Document is almost done after it's development hell has been crippling my progress of anything else. Writing the character information, and then the script will be next, which finally will be organized into visual elements. After that, real implementation of all the features will begin. I suspect that you use 'switch scene' on them? How do you scroll to the 40th? Is the list keeping track of the display-height?! My advice on large projects would be to make a ToDo list with rather simple things and a priority. Do not make a ToDo item that is too much work. For example a simple task: animation switching on furniture collision. Make sure you thoroughly enjoy when finishing one of those items! Like a mile-stone event! Not a big party , but take time to reflect on the issue rather than ticking it off the todo list and moving on. This will hopefully give you the satisfaction when completing an item. Hang on and I still enjoy seeing the progress you make! These small snippets of block control the whole map select. The list itself is stored in the behavior. 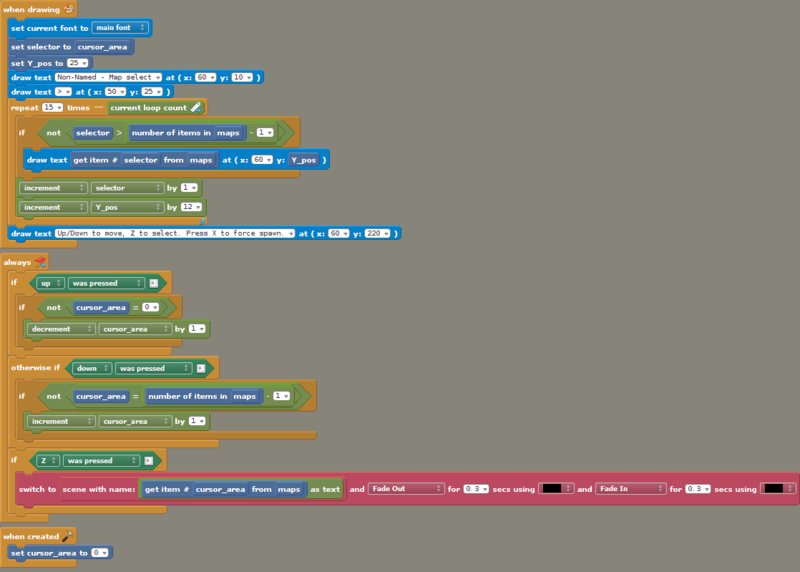 The list scrolling is controlled through 2 variables inside the list loops on the drawing. Very optimized. Ah : you keep the 'selected / to be selected' item on top. I was thinking you would scroll the '>' down and wondered how you would handle the selection. Cool! Well, good news! The Game Design Document is pretty much done (including the story outline, as I finally settled for one after 4 re-writes). As now second phase of planning starts. Hopefully, things go smooth this time. Just a note on what's done! • Item sprites – not done, only examples built. • Sound panning – ?